The Acoustic Cradle system is to enable floating floors to be fitted and allowing for services to be run beneath. 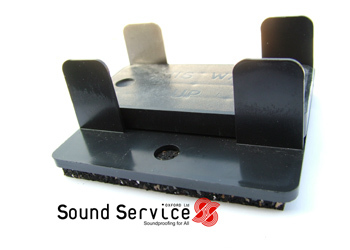 The Acoustic Cradle system is ideal for levelling uneven floors with the application of various thickness of spacers along with retaining its full soundproofing potential. This Acoustic Cradle system is designed to comply with Robust Detail E-FC-1 or E-FS-1 as well as being Part E compliant and can be used on both concrete or timber suspended floors when building or converting to a separating floor. The cradles are produced with a 10mm resilient pad that decouples the floating floor and also absorbs impact noise and is designed to accept and securely hold timber floor battens. Different thickness packers for use beneath the battens inside the cradle can also be used to create a perfectly level floor if being installed on an uneven base floor. 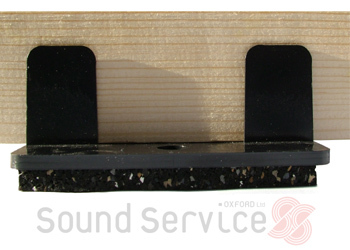 Sound transmission standards of ADE 2003 (amended 2004) are met with the correct installation of this system. To be used over level or uneven concrete floors for conversions, refurbishments, change of use or new build. Floating floor meets the descriptive FFT2, within Robust Details E-FC-1 or E-FS-1. ABOVE: Showing Acoustic Cradle with Plastic floor levelling spacer.